Who/What is Bog Baby? Where can I find the story? Is Bog Baby real? Where does Bog Baby live? 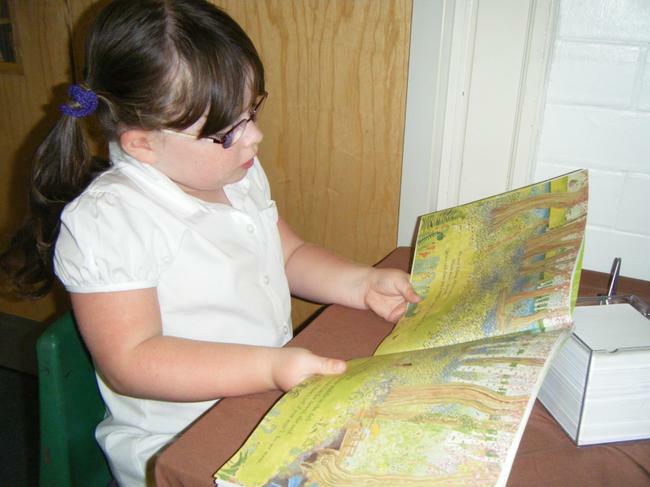 The Bog Baby is a truly magical story by Jeanne Willis and Gwen Millward. But the Bog Baby is a wild thing, and when he becomes poorly the girls decide they must tell their mum. She tells them the greatest lesson: if you really love something, you have to let it go. We're going on a Bog Baby hunt! We arrived at Bluebell Woods. 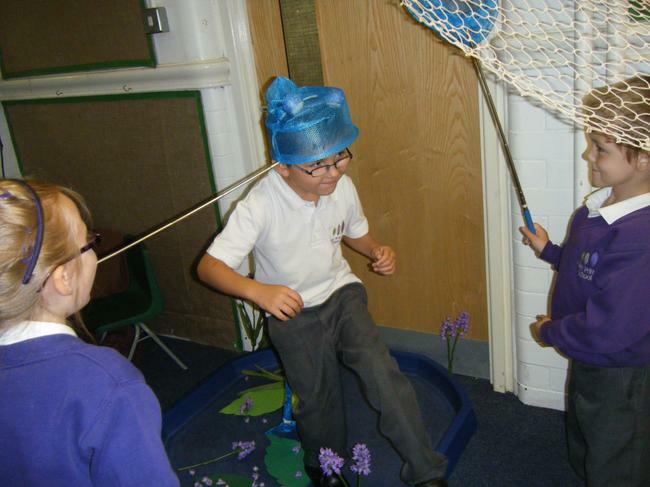 Fishing for Bog Babies in the pond. Are they in the bush? Have you looked in the willow tunnel? 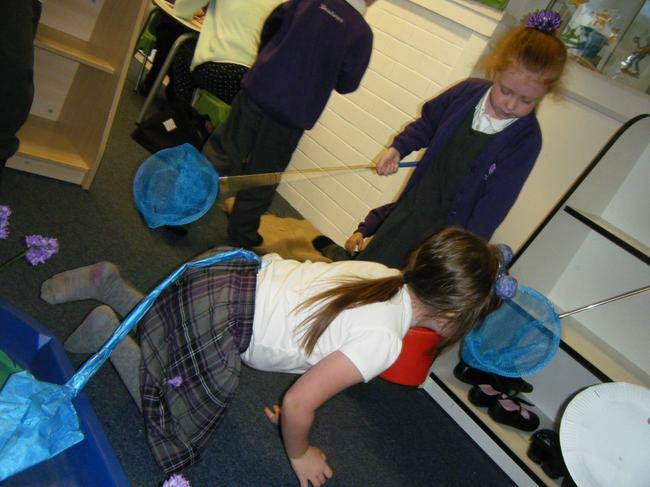 The teachers acted out the story! 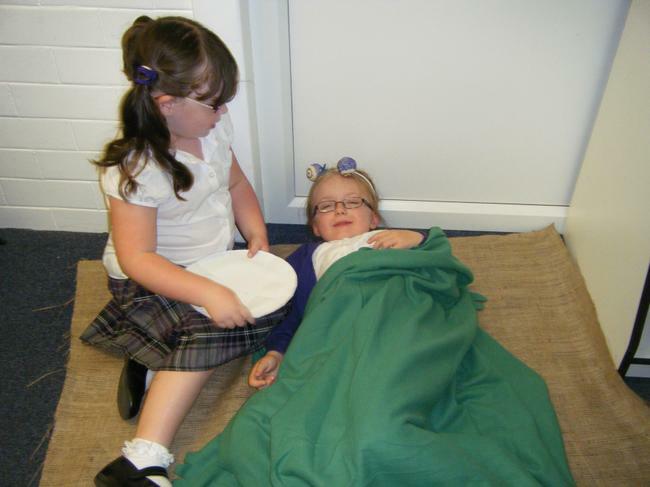 We have been working hard in continuous provision. How long is your model? Does the Bog Baby fit in it? We have been labelling different body parts. On a warm afternoon Chrissy and Annie decided to take Bog Baby for a walk. They made him a collar and a lead and off they went to the park. They were having a lovely time until a crow swooped down to catch Bog Baby! Luckily enough the girls scared the crow off, just in time! To make sure our class Bog Babies stay safe from the pesky crows we discussed what we could make to scare off any unwanted guests. We decided on scarecrows! 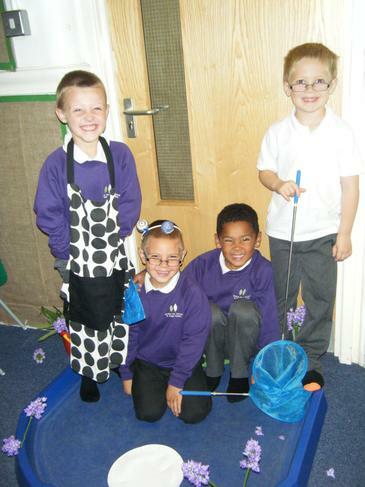 We designed our own scarecrow, made them in continuous provision and even made a life size scarecrow for each class. Surely a huge Bog Baby would scare away a crow? Annie and Chrissy's teacher, Bog Baby and Dr Harold O'Hay (Bog Baby specialist). We filled in the Dr's health record. Our Scarecrow Assembly - Harvest. A big, red combine harvester! 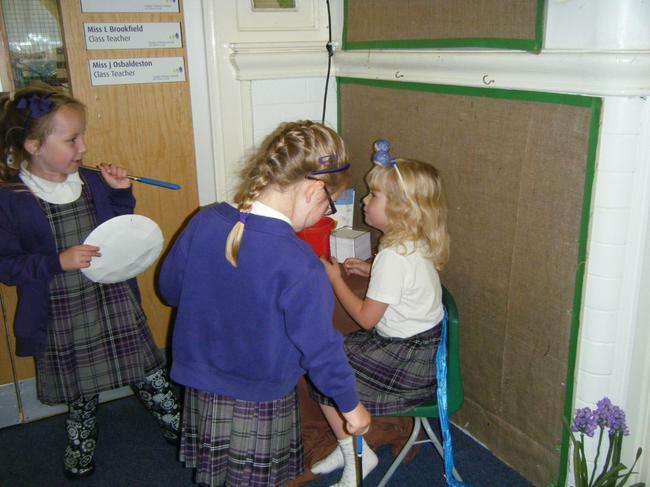 A visit from the health visitors. The health visitors from the Children's Centre came in to check our Bog Babies are healthy and growing properly. We don't want our Bog Babies to get sick like Chrissy and Annie's! As a class we discussed what we knew about health visitors, wrote questions for the health visitors using question words and question marks and finally wrote about what we had learnt. 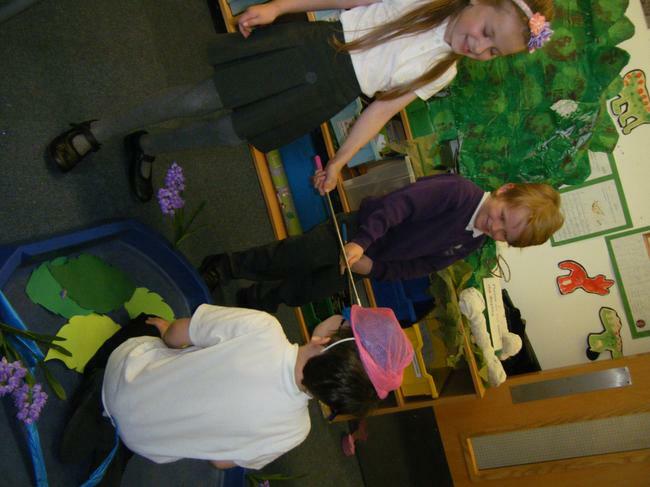 The Health Visitors have said that 1EB's Bog Baby is fit and healthy. 1SC also have a healthy Bog Baby. He is 20 centimetres tall and he weighs 20 grams. We told the health visitors how we care for our Bog Baby and they said what a good job we are doing! Let's see how tall Bog Baby is..
We have been around school to stick missing posters up in the hope that somebody finds him. Fingers crossed! First we stuck a poster on the door where the parents collect us. Then we asked Mrs Dowie in the office if we could stick a poster on her window. Finally we asked Miss Bethel from year two if she had seen our Bog Baby! She looked worried too. She said we could stick our poster in Year 2. We have received postcards from the different countries that the Bog Baby had visited. They were England (London), Northern Ireland, Scotland and Wales. We stuck these postcards on to the map of the UK and had a chat about which country he visited first. Ollie said "I think he went to Wales first because that's the closest to Southport!" My name is Barnaby Bear. I’m friends with the Bog Babies and arranged to meet them last Monday at my house in Manchester. I thought I better email you and let you know that they are safe and sound. I have talked to them about the importance of always telling a grown up where we are going before going anywhere. I thought I would let you know what they have been up to while we have been travelling around the United Kingdom. They will be coming back to Southport soon. I have never visited Southport before so maybe I could come and visit you soon. Enjoy looking at the photographs. Take care. phone, text message, email, post card, letter, face time and note. Have a look at the holiday pictures below. We have been learning about the different countries in the United Kingdom and some of the major cities. We talked about the map and where we might have seen one. Liam said "I saw it on the tele when the weather was on." We decided to make our own weather reports. Take a look at a couple below. Bog Babies spotted on school CCTV. 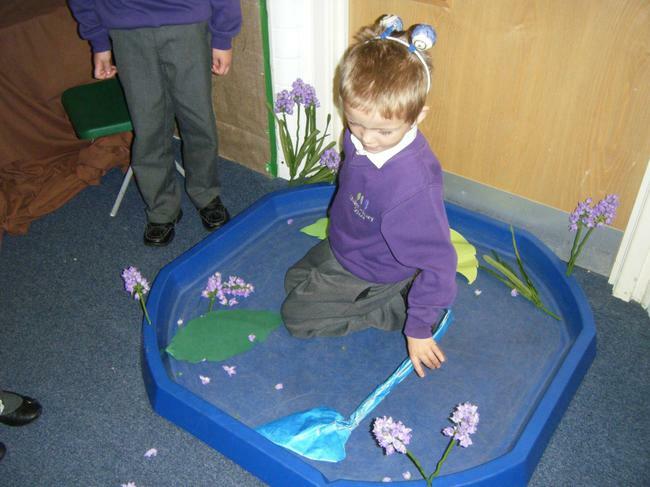 On Wednesday we received an angry email from Mrs Brown and Mrs Thomas telling us that they had spotted Bog Babies around school and they were unable to catch them. We were given evidence bags from around school and were asked to be detectives to work out where they had been and what they had been up to. We were focussing on adding 'ing' to the end of root words. At the end of the lesson we received another email; this time from Mr Povey! He had spotted the Bog Babies on the school's special CCTV cameras. Have a look at the camera footage below. 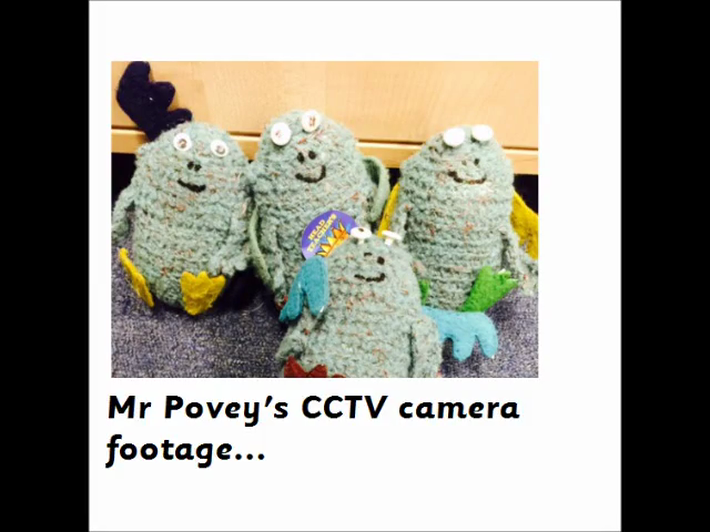 Bog Babies caught on school CCTV! When the Bog Babies finally got back to our classes we realised that they had got sick; we had to send him home to his pond. In preparation for this the children wrote party invitations, wrote me a very long shopping list and wrote and decorated a card to say goodbye to the Bog Baby. Then we threw a party for the Bog Baby, we played party games, had party food, sang our Bog Baby songs and he even left us a present to say thank you - a small, chocolate snowman! As well as the three Bog Babies we found in the Willow garden, there were also three that went home with the children. The teachers in Year 1 would like to say a big thank you for welcoming the Bog Baby into your home and supporting your child when writing in his diary.